'Two Feet Life' is a new road variety show where stars and their family, friends, and colleague walk through a nostalgic location together. 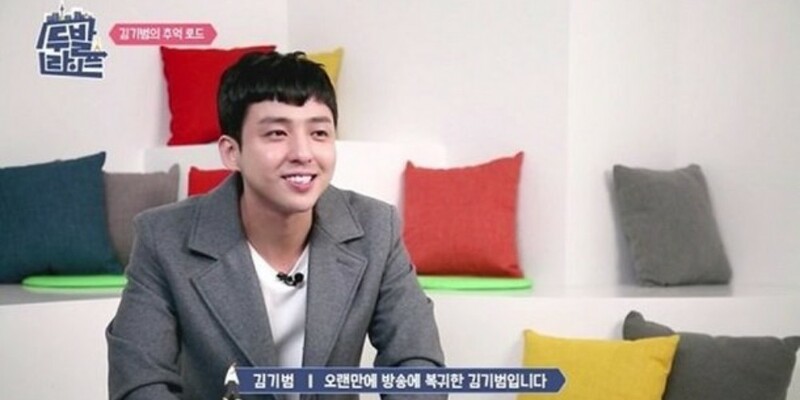 On the December 14 episode, Kim Ki Bum made a variety show appearance for the first time in years. He commented, "I think it's been more than 10 years since I appeared on a variety show. I'm very nervous." Kim Ki Bum visited his old hometown, SM Entertainment building, and his old dorm with his friends. Before immigrating to the United States at age 11, Kim Ki Bum lived at Dogok-dong. He visited his elementary school and teared up when he met the owner of the school supply shop. Next, he visited the apartment he used to live during his SM trainee days. He shared, "I used to live in the same apartment building as Lee Soo Man's parents. Lee Soo Man said he saw me in the parking lot and gave me his business card. And then I started training in Korea." Kim Ki Bum recalled his Super Junior days and said, "At the time, I lived with Super Junior and TVXQ hyungs," and shared, "Fans used to camp out here and wait for us." When asked if he keeps in touch with his former members, Kim Ki Bum answered, "I still talk to Heechul hyung. I've also met Donghae hyung this year. It was nice to see him." Kim Ki Bum got astonished by how SM Entertainment building changed, commenting, "Look how much SM has changed." It's great to see him again! And it's good that he keeps in touch with some members.